Figure 18.3 from the text provides a nice overview of mitosis. 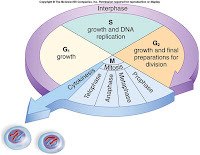 Figure 18.7 from the text provides a nice overview of meiosis. 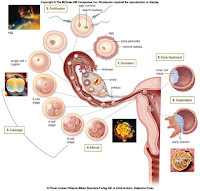 Figure 17.3 from the text illustrates pre-embryonic development. 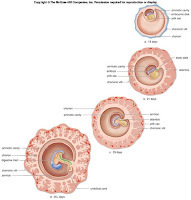 Figure 17.4 illustrates embryonic development. 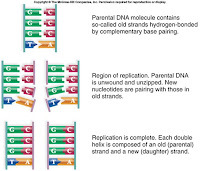 Figures 21.2 and 21.3 from the text show how, during replication, DNA is unzipped and new complementary bases of the nucleotides pair up to the old strand. Figures 21.11 and 21.13 from the text illustrate the process of polypeptide synthesis and and overview of gene expression. 2. Functional and comparative genomics - how do our genes function, how do they compare to other species? Definitions for chapter 18 can be found here. In 2005, cancer was the #2 leading cause of death in the US. With statistics like that, it seems like a no brainer - put into practice the recommended preventions of cancer. The text breaks down the list into two sections: Protective Behaviors and The Right Diet. A few behaviors one can change to help prevent cancer are to avoid smoke/smoking, avoid the sun and tanning beds, avoid alcohol and radiation, and be aware of occupational hazards. 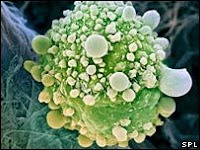 Many studies show that following a certain diet can also help in the prevention of cancer. Things like avoiding obesity, eating plenty of high-fiber foods, increasing consumption of foods rich in vitamins A & C, and including vegetables from the cabbage family in the diet. The American Cancer Society is a great resource for more information on prevention and detection. Definitions for chapter 19 can be found here. Definitions for chapter 20 can be found here. Transcription and translation. This is another area of biology that has me in complete amazement. The fact that we understand how our genes are copied and translated into proteins...the idea renders me speechless. And here it, my general overview. 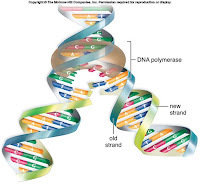 Transcription is the process by which a segment of RNA is made from a segment of DNA. The portion of the double helix that is to be transcribed unwinds and unzips so that the "ladder rungs" or bases are exposed. The exposed bases allow the complementary base pairs that will join to form RNA to line up in the correct order. RNA polymerase joins the nucleotides together to form RNA. rRNA, mRNA, and tRNA are all made in the nucleus in the same way. After production and processing, the 3 types of RNA move to the cytoplasm. 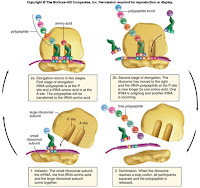 mRNA finds the ribosomes (rRNA plus proteins) where translation occurs. Translation is the production of a polypeptide chain; the order of the amino acids in the chain is determined by the order of condons on mRNA. Codons are made up of three bases on mRNA. A codon of mRNA will only bind with the corresponding anticodon of tRNA. Each anticodon correlates to an amino acid that tRNA also carries. As mRNA moves through the ribosome, the codons pair with anticodons. The amino acid that was associated with that anticodon on tRNA gets added to the polypeptide chain. In this way, mRNA dictates the order of amino acids in a polypeptide chain. Chapter 21 definitions can be found here.